This year’s conference explores the ways in which picture books contribute to the development of the child (or / and indeed the adult) through critical, imaginative, empathetic, creative or other responses. We will look at the international world of picture books; at trends and developments in creating picture books and publishing; at research on children’s interaction with picture books; and at some of the wide range of programmes and projects that use picture books as a starting point for their work. We will hear from eminent illustrators, including Laura Carlin who will be presented with her medal for winning Biennale of Illustration, Bratislava, one of the oldest international honours for children’s book illustrators, and about the new Klaus Flugge Prize for the most exciting newcomer to picture book illustration. Book tickets online at the Roehampton e-store now! Once upon an Oliver, we met a boy with a penguin friend, a curious girl who put her heart in a bottle, a moose that belongs to no one, a bear who was a paperplane enthusiast, and many more who, I daresay, live happily ever after in readers’ minds. Those picturebooks are excellent both in content and form, as are his paintings and music videos. 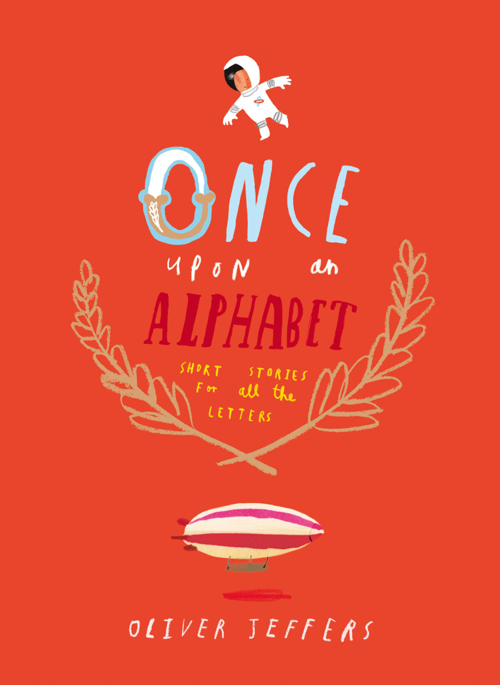 Without losing his distinct style, Oliver Jeffers keeps exploring and experimenting enthusiastically and he has outdone himself with Once Upon an Alphabet: Short Stories for all the Letters (2014). Again. Jeffers has reimagined the concept of alphabet books, shifting the emphasis from educational to inspirational (where Once Upon an Alphabet imparts information, on dark matter for example, it does so cheekily and sneakily). Lovingly dedicated to the letters without whom words and sentences and stories would be impossible, his book celebrates each letter with a short story of its own. Not to explain letters but for the letters. Lies We Tell Ourselves is a historical YA novel which interweaves a story of friendship, teenage identity crisis and burgeoning love into a brutal account of horrifying racism and prejudice. Set in the fictional US town of Davisburg Virginia in 1959, the story is narrated by two female protagonists; Sarah, a black girl entering a previously all-white high school, and Linda, a white girl who is the daughter of the town’s newspaper editor, a fervent white supremacist. In 1954, a time when open segregation was common in the southern states (‘white’ cafes, ‘whites only’ toilets, etc), all US schools, by Supreme Court ruling, had been required to become racially integrated (the Brown v. Board of Education ruling); the Court ruled that states must integrate their schools “with all deliberate speed.” Nevertheless, many Southern politicians resisted the ruling, utilising technical delaying tactics (some schools were shut down by local politicians or school boards for months or years – a history alluded to in the book), economic reprisals and direct intimidation in order to maintain a segregated and two-tier education system. Robin Talley grew up in Virginia, and decided to write this novel after hearing her parents discuss their own teenage memories of high school desegregation in the 1950s. She investigated historical records, including diaries of black students, and speaks on the Carnegie website of her shock at what she discovered during her research and her determination that the facts of history should be better known. In 1957, a federal court ordered integration of the Little Rock, Arkansas public schools and nine African-American teenagers were enrolled into the Central High School. Such young people had thus been placed in the frontline of the struggle for civil rights, and on arrival, the ‘Little Rock Nine’ encountered a vicious white mob. This scenario clearly inspired the powerful opening chapter of Talley’s book, when the ten new black students turn up for their first day at Jefferson High, to be greeted by “a sea of angry white faces” and calls to “keep the niggers out”. The author pulls no punches in depicting the intimidation that her fictional characters face; from the outset the shocking language and physical violence aimed at them is described in challenging terms. As the progress and experiences of these students are followed throughout the school year, Talley maintains and builds suspense through her realistic description of events. No-one, apparently, is safe; incidents such as the false arrest and subsequent vicious life-threatening beating of Chuck, Ennis’s decision to leave Jefferson, Sarah’s final assertive rejection of her parents plans for her future, all reinforce the realism of this text while also ensuring that reader engagement is rooted in the unexpected turns of the plot. bell hooks, Neal Lester, Noliwe M. Rooks and others have written on the politics of African-American hair and the way that Black women and girls, subjected to “white supremacist capitalist patriarchy” (hooks, “Straightening”), feel enormous pressure to conform to the White beauty standard. Instead of accepting their naturally textured hair, these scholars assert, African-American women and girls collectively spend millions of dollars annually to have it straightened, extended and/or altered in other ways to make it straighter, longer, lighter and often more similar to Caucasian hair. This essay builds on that work, taking as a starting point Martin’s and Washington’s autobiographical hair tales and making the primary focus of the argument a select subset of children’s picture books about Afro hair: Camille Yarbrough and Carol Byard’s Cornrows (1979), Alexis De Veaux’s An Enchanted Hair Tale (1987), Natasha Anastasia Tarpley and E.B. Lewis’s I Love My Hair (1998), Carolivia Herron and Joe Cepeda’s Nappy Hair (1999), bell hooks and Chris Raschka’s Happy to be Nappy (1999), Sylviane A. Diouf’s and Shane Evans’ Bintou’s Braids (2001), and Dinah Johnson and Kelly Johnson’s Hair Dance! (2007). The lies begin at the beginning. The author/narrator lies to us right at the start. Shelby’s Mom has been lying to her all her life, she lies during this story. The coyote figure tells Shelby that there will be two lies and then there will be the truth. This may be about the only thing which is reliable, although we are kept speculating about which stories/versions/revelations are lies – or the lies. Fire Colour One is the story of a young girl, Iris, whose first meeting with her father, Ernest, is not until shortly before his death. The narrative revolves around Iris’s growing relationship with her father in the short period she has with him. However, we are introduced to the main characters immediately after Ernest’s funeral. The author takes us through the events leading up to the funeral, moving backwards and forwards in time throughout the book. Potentially, this could have been confusing, but Valentine handles it extremely well and we are taken, along with Iris, on a journey of discovery. Valentine manages to successfully blend instances in Iris’s previous life and her friendship with Thurston, with those of Ernest’s earlier life with his sister Margot, and then his later marriage and its subsequent break up. All this is seamlessly interwoven with the story of Iris’s reunion with her estranged father and the growth of their relationship. The book’s ending may be considered a little too contrived; however, I felt it worked well overall, leaving the reader feeling that justice was done. Valentine uses contrasts in the book to highlight opposing views of certain issues. She quotes Grayson Perry’s autobiography in which he talks about going to college and learning art as something you do, then moving into a squat with people who lived it (http://www.carnegiegreenaway.org.uk/watch.php?id=). Iris’s best friend, Thurston is still in California and although Iris has been unable to tell him of her departure to England, she constantly refers the reader back to some of his escapades, portraying him as an artist in the true sense of the word – someone who lives art, rather than someone for whom art is something you do. On the other hand, Ernest is a collector of works of art as possessions and for financial gain (although Iris discovers later that this is not the whole story). Iris’s relationship with Thurston, who likes her for who she is, also highlights the lack of a proper relationship with her mother, for whom Iris is merely a bargaining chip to be used to help her and Lowell acquire Ernest’s art collection. The picturebook draws on a long tradition of wordless books, from Frans Masereel and Lynd Ward in the 1920s to Shaun Tan and Aaron Becker in the 2000s. As with any purely visual text, there are narrative ‘gaps’ between each image, which the reader must complete to create his or her own version of events. But Smith uses a number of visual ‘clues’, such as colour, line, perspective and composition, to draw us through the story. The plot centres round a little girl who collects wayside flowers on a walk through a city with her father. It is set in a contemporary urban landscape and begins in austere high-contrast black, white and grey, with the girl’s bright red coat providing the only colour. Yet as the child gathers more flowers and gives them as gifts to various recipients, the volume of colour increases, until finally the book ends in vivid full colour. This infusion of light, bright shades onto the pages highlights the girl’s innocent generosity; by giving away her flowers, she literally brings colour into a grey world.